During summers growing up in suburban Pittsburgh, I watched the BBC show Nature w/ George Page everyday and imagined those exceptional places. Living in the Bay Area, I can now visit world class destinations with just a reasonable drive. My sons will grow up thinking these nature bonanzas are normal. Ano Nuevo State Park (http://www.parks.ca.gov/?page_id=523) is a world class destina tion. Thousands of massive elephant migrate to a beach between Half Moon Bay and Santa Cruz from December to March. They fight for dominance, gather in groups, give birth to pups, wean them, and return to the ocean. In February, most pups have been born, and females are starting to return to the ocean to feed. 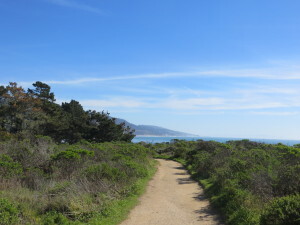 The drive to Ano Nuevo across the Santa Cruz Mountains and South on CA 1 is adventure enough. In February, the hills are green (with the winter rains) and the fields are golden (with mustard plants – planted by farmers to replenish the soil). 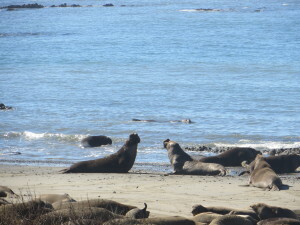 A few months ago I reserved one full elephant seal tour w/ 20 s pots. 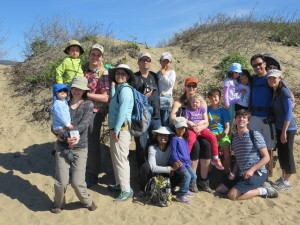 Four families joined us for a 3 miles docent lead hike across dunes to within 20 feet of these up to 5000 lbs animals. After collecting our tickets, our group of parents and kids ages 4 +/- 3 years hiked toward the rallying point. The well graded, trail follows a peninsula jutting out into the Pacific. We passed remote beaches, surfers, ponds, coastal scrub, and vistas of the Santa Cruz Mountains. In the dunes, we could first hear sounds like an outboard motors revving up or a loud burp. Then, we could smell an earthy odor. 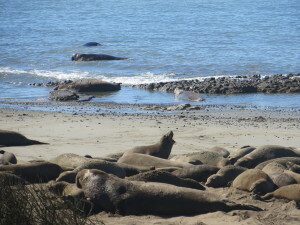 We could hear and smell the elephant seals before we could see the main colony. A few immature males – only ~3000 pounds blocked our way, so our tour gingerly walked around them. After a few more stops, we saw some elephant seal bones, more seals, the abandoned house on an island walked back. Great fun was ha d by all. My four year old walked the whole way, and my 10 month old smiled, babbled, and enjoyed being outside for his longest outdoor hike to date. The sunny 70 degree weather did not hurt either. We then gathered at an outstanding refuge along the coast – Costanoa (http://www.costanoa.com) – for a well deserved, late lunch. With a little advanced planning, Ano Nuevo is a world class adventure within easy driving distance of 6 million people.